How the House Leadership Abuses Taxpayers Daily & HOW John Rhodes Works For Reform! so he can continue fighting the good fight for the Taxpayers and Families of North Carolina and North Mecklenburg! Vote for John Rhodes on May 2. 5 Minutes With Rep. Rhodes work in the House. The House and Senate introduces the ANNUAL state budget of around 300 pages or more at the last possible moment and then demands your elected representatives approve it SIGHT UNSEEN! The representatives had all of five minutes to read or understand the over 17 BILLION DOLLARS they were about to spend. If they declined to approve these massive tax and spending increases as John Rhodes did in his freshman term 2003, and again in his second term per the House Speaker's dictatorial command, then legislative assistants in some cases are FIRED, member's office assignments are changed, committee assignments are stripped, and some representatives RIGHT TO SPEAK during House debate on YOUR BEHALF is ended. Despite this abuse of power by the leadership over YOUR ELECTED REPRESENTATIVES, John has remained consistent and been persistent and proposed to the House of Representatives H.R. 1496, a 24-HOUR WAITING PERIOD to allow lawmakers time to review and study the budget before a vote on the budget could occur. Jim Black, the Speaker of the House sacked Rhode's proposal but the response from the media to pushing this reasonable proposal aside was overwhelming. The corrupt House leaders were exposed and adopted Rhodes' proposal. Working together with his colleagues, John Rhodes is changing the way the House of Representatives operates through UNCOMPROMISED LEADERSHIP. John continues to work with his colleagues in the House to push for a minimum 72 hour waiting period so they can review the entire budget. We need John Rhodes to keep fighting the good fight and continue the job he started in ending such abuses of power. To STOP this INJUSTICE and shed the bright light of truth on corruption we must reelect John Rhodes. RHODES' EFFORTS are bearing fruit as the HOUSE SPEAKER (above) is referred for prosecution. Your House Speaker has created questionable ILLEGAL SLUSH FUNDS of millions of YOUR DOLLARS. More tax money than you will ever pay IN YOUR LIFETIME has flowed through his hands to his friends, patrons and willing cronies. John Rhodes took action and protected our interests by doing something about this abuse. JOHN RHODES led the call for investigations of the legislative leaders in these arguably illegal and unconstitutional practices and for them to step down from their leadership post while a full investigation could be completed. Not a popular stand back in March of 2005, but now over twelve major newspapers across the state are calling on the House Speaker to resign. John called on our State Auditor and State Attorney General to investigate these abuses by legislative leaders. See video of John protecting our interests in Raleigh. While our children and families suffer, while roads are in disrepair, while our educational system is collapsing, your leadership has STIFLED DEBATE and MISSPENT MILLIONS on private deals to reward his cronies. Political payoffs like a Teapot Museum in exchange for a vote for tax and spending increases ($1.2 Billion increase in 2005-06) will not help the taxpayers in John's district nor this state with our MOST ESSENTIAL NEEDS. John Rhodes is working to change the process and has been successful working with his colleagues to do so. Another example of John's belief that NORTH CAROLINA DOES NOT HAVE AN INCOME PROBLEM, it has A PRIORITY OF SPENDING CRISIS. The legislature does not need to extract any more money from the hard working taxpayers of our state. As a result, now the tens of millions that were secretly hidden in the budget under "miscelleaneous", are spelled out line by line in the budget. All of North Carolina can see the unbrideled and reckless spending of the current leadership in Raleigh. Working with other representatives, John has authored H.B. 492, a TAXPAYER's BILL OF RIGHTS (TABOR) for North Carolina, which would eliminate growth in government spending and stop the abuse of taxpayer's dollars. We need John Rhodes to keep fighting the good fight. We need to keep him Raleigh to continue to bring to light the hidden deals that proliferate in our House and end the inappropriate allocation of your taxes for unbudgeted, unapproved purposes. Your House leaders hold taxpayers HOSTAGE with PROMISES of local projects while the majority of the tax dollars flowing from our district never return. Your district is represented by the person voted NORTH CAROLINA LEGISLATOR OF THE YEAR for 2005 - JOHN RHODES. Due to his perseverance in the face of overwhelming odds, John Rhodes has made a difference and is working hard to SUCCEED ON YOUR BEHALF! He will not trade phony promises for real results. His efforts are changing the way the N.C. House of Representatives operates. John has proven through two terms he works for the taxpayers and families of his district, not the self-perceived power brokers. He will not work for special interests, local bureaucrats, and others who want more PRIVATE BACKROOM DEALS and CORRUPT OFFICIALS. Perhaps that is why they hand-picked and support his primary opponent. We need to tell them we aren't buying MORE LIES and CORRUPTION. We need John Rhodes in Raleigh to keep fighting the good fight for us. To halt the process that allows political corruption to become the center issue when the real issue is YOUR FAMILY and YOUR MONEY. While John Rhodes first BLEW THE WHISTLE, the "good old boy network" sat and laughed. At one point, the Speaker of the House arrogantly compared Rhodes' efforts to David trying to fight Goliath. While John Rhodes pressed the issue of corruption in the House, they took notice. They were sure they protected themselves adequately from PUBLIC SCRUTINY. While John Rhodes let the taxpayers know the underhanded activity occurring in their House, the leadership went on the attack - against John. They actually attacked the messenger. While John Rhodes assisted in bringing the major media to bear on the situation, the leadership feigned indifference, denounced him and the public inquiries, and then started breaking down. While John Rhodes HELPED RAISE AWARENESS of the devious nature of patronage and rewards rampant in the House, the leadership had to circle their wagons. Now the House leadership is UNDER INVESTIGATION and has been subpoenaed to testify due to the serious charges leveled by many sources. While John Rhodes continued to fight for taxpayers to protect your interests against the very corrupt and powerful established base, the media finally joined the battle, and has recommended in at least a dozen newspapers that your House Speaker, JIM BLACK, RESIGN. Now, the House leaders don't seem to be laughing any more. We need John Rhodes to keep fighting the good fight. He fought alone when necessary and patiently, courageously kept the fight up until the authorities had to move against the corruption. He worked with his colleagues to continue the pressure. He can't stop now and should not. When local leaders tried to strike more BACK DOOR DEALS with Jim Black and the NC Department of Transportation, John Rhodes stopped them cold. Why would he say no to the politicians in his own district? Because what they were attempting to do was wrong. They wanted land at a cheap price so they tried to circumvent reason and impose eminent domain on unsuspecting average taxpayers. John Rhodes said NO and stood by his guns to keep our towns from becoming mini-dictatorships with UNBRIDLED POWER. John is willing to listen to local elected officials and is interested in hearing their ideas. Every time local government presents ideas to John that he rejects, they have a consistent theme that must be opposed: They either raises taxes on the public or seek to create an "end run" around existing law or the Constitution. Every proposal brought to John Rhodes by town officials has attempted to take power out of the citizens hands and relinquish it to the town board in hopes they will protect citizens' rights. Clearly, the towns wanted to just grab land at the cost of your friends and neighbors. That is why John will not support their resolutions. John will stand in the gap to protect your freedoms. John Rhodes is FOR PROGRESS but not at any cost. John Rhodes works for TAXPAYERS and FAMILIES FIRST. The power hungry special interests who walk the halls of Raleigh and other political bodies will have no choice but to face him when they try to secretly undermine YOUR FREDOMS and impose higher taxes on your family. When Mr. Smith went to Washington he didn't do so to bend to what other politicians told him to do. He went to represent the taxpayers. 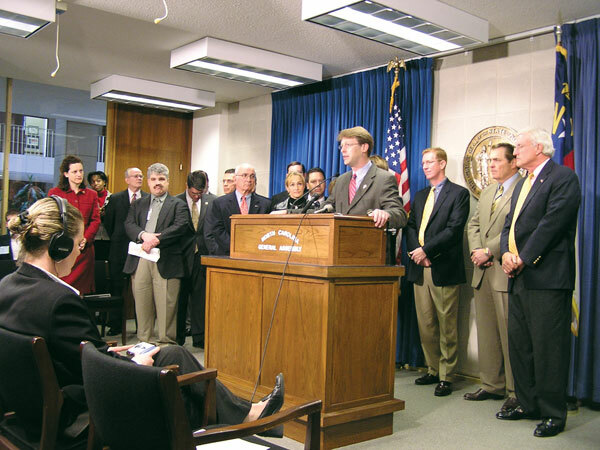 John Rhodes goes to Raleigh to do the same and has a rock solid record of defending taxpayers. What Price Honesty and Integrity? Call him idealistic, but when John Rhodes goes to Raleigh, he does so to REPRESENT YOU, regardless of what others may throw at him. Our founding fathers faced off with our foreign overseers and a new nation was born. John Rhodes serves with courage and integrity. John Rhodes believes that by continuing his own efforts and working with his colleagues in the House we can take back our state, balance the budget, eliminate waste and corruption and clear the path for a new generation to live more affordably, in a healthy, growing economy. One that supports excellent schools and provides opportunities for ALL CITIZENS.